Windows Live Messenger 9 Beta sound effects too quiet? Together with a bunch of cool new features, the Windows Live Messenger 9 Beta also introduced an updated set of default sounds. While very similar to the sounds we've grown accustomed to, they sound smoother and a lot more quiet. The latter has stirred up complaints from various groups of people: those using Messenger in a noisy environment, while listening to music/radio, while located further away from the computer, or simply those of you with hearing problems. Because it's a bad idea to crank up your speakers' volume in order to hear them (imagine an unexpected error prompt's sound effect at deafening volume), I've amplified the default Messenger sounds and normalized them to the level of the previous versions as well as the standard Windows sounds effects. Just unzip the archive into your Messenger program directory (usually C:\Program files\Windows Live\Messenger) and replace the existing sound files. You might actually notice somebody signing in for a change. UPDATE: Download link is working again. Sorry for the inconvenience! >> Download Louder Messenger Sounds set. To all Messenger development enthusiasts out there, replace your bookmarks with this URL for your questions about activities, web controls, bots and toasts. The forum software sports "increased performance, stability and an improved user experience". Posts, points and your threads have been preserved, except your Windows Live Alerts for threads you were tracking. There's also an updated tutorial and sample for the Windows Live Messenger Library over here, and a simple demo page hosting all samples. What kind of Rock Hero are you? Originally, these were t-shirt designs by Torso Pants but they've discontinued the Band Geek Hero line :( Make sure you check out their shop for other funny tees though! >> Browse all 33 Band Geek Hero Display Pictures. 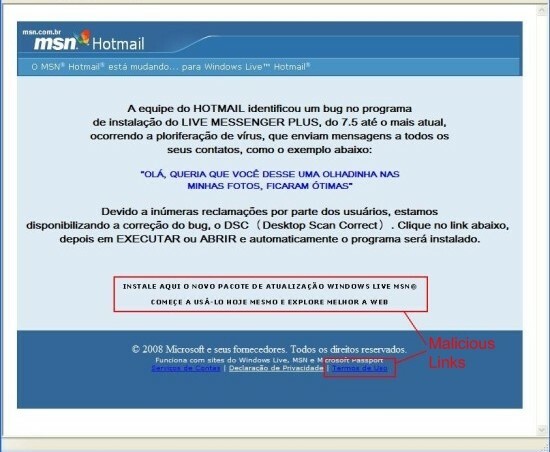 An e-mail is being spammed around inviting users to download an updated version of Live Messenger Plus, supposedly an application which protects the user against a virus that spams instant messages to online contacts. Not to be confused with Messenger Plus! Live, this is actually a non-existent piece of software but a Trojan recognised by antivirus vendors as Mal_Banker (TrendMicro), Trojan.Downloader.Banker.BS (BitDefender) or W32/Banload.A.gen!Eldorado (F-Prot) to name a few. A scheduled task is then created, and modifications are made to autoexec.bat to disable GBPlugin and other tools promoted by Brazilian banks to protect against such keyloggers and other malware. Details on other malicious applications targeting this security software can be found in our previous blog on G-Buster Browser Defence. The malware then goes on to conduct information-stealing activities. >> More details (and a screenshot) at Websense. - 4 nerdy "I'm a PC" smiley emoticons. >> Download the I'm a PC Messenger Theme Pack here (IE only and make sure you're signed in when downloading). As planned, Microsoft has started forcing users of Windows Live Messenger 9.0.1407.1107 -the previous 9.0 beta that leaked last year- to upgrade to the client's latest version (buid 14.0.5027.908). The "What's new" button takes the user to a page with information regarding Windows Live Messenger 8.5, but it is really the Windows Live Suite for Wave 3 that gets downloaded. Users of Windows Live Messenger 9 who are seeing error 84cb0004, error 84cb000a or error 81000451 when trying to sign in, stop punching your screens. Your locally stored Messenger contact list got corrupted and here's the fix. You have to delete the Messenger contact store from your computer, so that an uncorrupted version can automatically be downloaded from the server the next time you sign in. Some of the related files are hidden by default, so you'll have to reveal hidden files and folders in your operating system first. Step-by-step instructions for either Windows Vista or Windows XP can be found here. If these instructions don't resolve your problem, Microsoft suggests you contact the Messenger technical support team here. >> Read the entire knowledge base article: Error 84cb0004, Error 84cb000a, or Error 81000451: You cannot sign in to Messenger.